utter adorability!. और utter adorability! This family is just too much!Source and additional तस्वीरें here:LOTRF. Wallpaper and background images in the Jared Padalecki & Genevieve Cortese club tagged: jared genevieve padalecki. 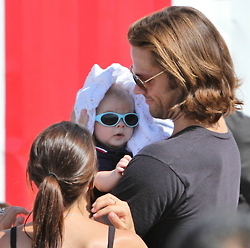 This Jared Padalecki & Genevieve Cortese photo contains धूप का चश्मा, काला चश्मा, रंगों, काले चश्मा, and रंग.